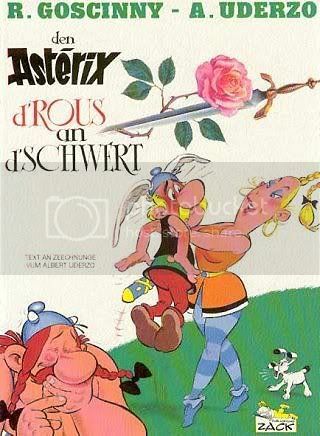 Whenever I am abroad, I try to score Asterix in a new language or dialect. Most common European languages are already in my collection; Germany is very good for dialect translations. In Luxemburg I had to ask around a bit. French seems the most common language, German is acceptable as well. But they do have their own language as well, “Lëtzebuergescht”, which appears to be a mix of the two aforementioned languages. Therefore I did try to read the book anyway, even though I can’t speak a word in their language. It was funny to try. Obviously having read most Asterix stories at least 3 times (Dutch, another language, a German dialect), it is easy to follow the history, and even the words weren’t that easy. Most words resemble either French or German, sometimes even my native Dutch, so it wasn’t the most difficult read.